BRANSON, Mo. (June 24, 2011) - Tournament leader Stacey King hoped to extend his pound and a half lead on Mark Menendez on Day Two of the PAA Bass Pro Shops Tournament Series Presented by Carrot Stix event on Table Rock Lake . That wasn’t a problem because Menendez only managed four fish for 8.25 pounds today. But while King’s 15.41 pound catch kept him in first heading into the final day of competition, his lead over second place grew more tenuous. Frog Tape pro Brian Travis, who entered Day Two in 5th place, added 17.78 pounds of Table Rock bass to his 16.98 pound Day One catch and now sits just slightly over a pound behind King. Will King’s mercurial 20.12 pound first day catch propel him to victory on his home lake or will the steadier sacks brought in by Travis prove to be King’s undoing? The other three anglers in the top five after Thursday – Menendez, Kelly Power and James Watson – all fell out, making room for Tommy Biffle, Terry Butcher and Mike McClelland to claim their vacated spaces. McClelland jumped the greatest distance of all of them, from 18th place into 5th on the strength of his 18.16 pound catch. He sits over five pounds behind King, though. Meanwhile Biffle is a little over three pounds out and Butcher is off the winning pace by just about four pounds. Menendez fell to 13th overall. He’ll have a chance to make up ground tomorrow, but he probably lost an opportunity to win. Gary Yamamoto was the last man inside the top twenty cut with a two-day total of 23.20 pounds. The unfortunate first man out was Texas pro Justin Rackley, who tallied 22.73 pounds. Nitro pro King was disappointed that he weighed five pounds less today than he did on Thursday. He believes that this morning’s stormy conditions hurt his bite. “I would rather see bright, sunny conditions tomorrow,” he said. “They typically don’t run much water on the weekends and there will be more traffic out there.” He had only seven “good bites” today, culling once and losing another fish that would have helped him. Gene Larew pro Tommy Biffle’s tactics this week are no secret. He’s putting a couple of flipping sticks on the deck in the morning and using them until it’s time to come in. Booyah pro Butcher jumped up from 11th place into 4th with a 17.64 pound limit. After a difficult year on the Elite Series trail, he said he’s fishing by instinct this week and with more confidence than in the months gone by. “I think I have a little deal figured out on what they’re doing,” Butcher said. “I ran new water today and had a limit pretty early. That helped – I knew I’d secured a check.” He’ll have to have another big limit tomorrow and hope that some of the three anglers ahead of him stumble in order to claim the win. Hefty pro Mike McClelland also had an uncharacteristically tough year on tour so far in 2011. This tournament started off equally rough – he didn’t have a keeper until after noon on Thursday – but he “fought through a personal battle yesterday” and made a monster leap today. “The biggest thing was that yesterday I fished too fast,” the Arkansas pro explained. “When they finally bite, they’re pretty aggressive, but getting them to bite is tough.” He’s fishing all large-profile baits including a big jig and a Zoom Ol’ Monster worm and “in the afternoon went even bigger,” although he declined to specify exactly what lure that change involved. Local top stick Kelly Power made the same realization as McClelland that it was important to slow down, but he didn’t implement that plan and fell down the leaderboard. Menendez believes that the early morning storms hurt him. After landing over 25 keepers on Thursday, he could manage only four today. “My day started a little slow,” he said. “The clouds killed the flipping bite. I ran as far to the west as I could to get to the high skies and when I got there I started getting bit.” Unfortunately for him, it was too late to salvage the day. The question remains whether any of the anglers still in contention will have enough time to catch King, or whether he’ll hold on for his first PAA victory. The tournament continues through Saturday going out of Chateau on the Lake marina. Daily launches and free 3 p.m. weigh-ins the first two days will take place at Chateau on the Lake. 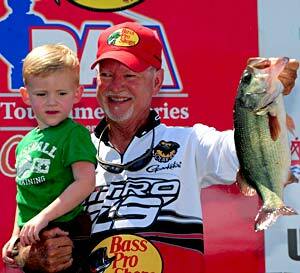 The final day weigh-in will begin at 4:30 p.m. at the Bass Pro Shops fountains at Branson Landing in Branson. At stake for the winner is cash and a new Nitro Z-8 with a Mercury 225 Optimax and T-H Marine Atlas jackplate, with a Humminbird 898c Si Combo to the Humminbird Big Bass of the Tournament winner.